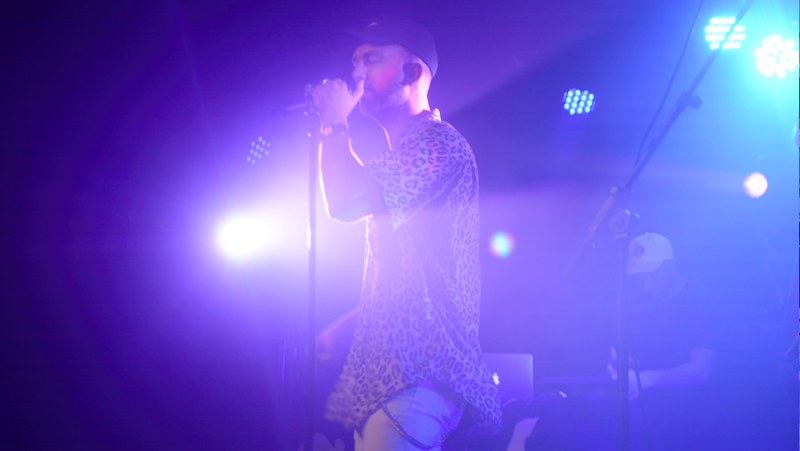 With dance moves out of this world, a unique sense of fashion, and energy like no other, I couldn’t have missed SonReal’s performance at Maxwell’s Sept. 23. I wouldn’t have thought I’d become a completely crazed fan girl until I saw SonReal live in concert for his, No Warm Up tour. From not knowing anything about this eccentric, energetic, and charismatic artist back in 2015, I have been converted to an obsessed fan who currently knows about all of his songs. My heart raced with excitement as I entered Maxwell’s dark and chill concert hall. R&B music played in the background complementing the atmosphere. People were scattered around the room socializing while patiently awaiting the performance of the night. I utilized my time by casually viewing the SonReal merchandise for sale: T-shirts, hoodies, hats, and of course his new EP, The Name. To get the audience warmed up, special guests Clairmont the Second and Ramsay Almighty showcased their rap music. At the end of their acts, the concert hall became more crowded and the audience definitely woke up. I could feel the energy rise, as the genuine SonReal fans anticipated his entrance. We waited about 10 minutes through chanting of SonReal’s name and chatter until SonReal’s guitarist appeared on stage soloing a beginning rhythm in preparation for SonReal’s entrance. SonReal has shown significant growth as an artist from having a few fans show up to his shows to now, a concert hall filled with people who know his songs. The concert went on and he sang hit songs such as “Everywhere We Go,” “No Warm Up,” and “Preach,” which the audience chanted for SonReal to perform. The energy was so high that SonReal had his friends and guitarist crowd surf! Before performing “Can I get a Witness,” he mentioned how he was too scared to become too pop or too mainstream, as that song has a pop rhythm and vibe to it, compared to his past songs, which are more hip-hop and soul. All in all, the audience kept their high energy by singing along passionately, and grooving to the song; this created a wholesome and warm experience. As the concert came to an end, I didn’t want him to stop performing, and I’m sure the majority of the audience would have come to the same consensus. SonReal thanked the audience for being so lively and dropped the mic signaling that the concert had come to an end. He hosted a meet and greet after the concert where he embraced, laughed, and took photos with his fans.